I hope everyone enjoyed their holiday weekend. I just wanted to quickly share a card I made for the Quick Quotes Blog Link Up – Challenge. The challenge is over and a winner has been chosen. Here is the card sketch that we were to use. Here is the card that I came up with. 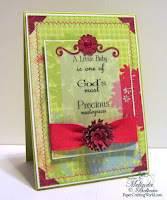 The patterned paper is from the Quick Quotes Savvy Davvy line. The flowers, tiny flourishes and photo corners were made using a couple of Martha Stewart and EK Success punches and using the back of the Savvy Davvy 200 Designer paper. I brushed the flowers with a little Bloody Mary Chalk Ink and added a touch of Red Stickles to the centers of the flowers. The Ribbon is from Quick Quotes as well as the adorable Vellum Quote. I used some pop dots to raise the center panel just a bit. Lastly, I used my sewing machine to add the decorative sewn border. Be sure to head over to the Quick Quotes blog and become a follower. This way you can stay abreast of all the fun, upcoming challenges! Beautiful card, Melin! Love the color combination and that is one of my favorite quotes. Like the baby card. Especially like the stitching on the bee-utiful paper.